This image was taken from the 14th floor of Independence Wharf, overlooking Atlantic Avenue in Boston, Massachusetts (USA). 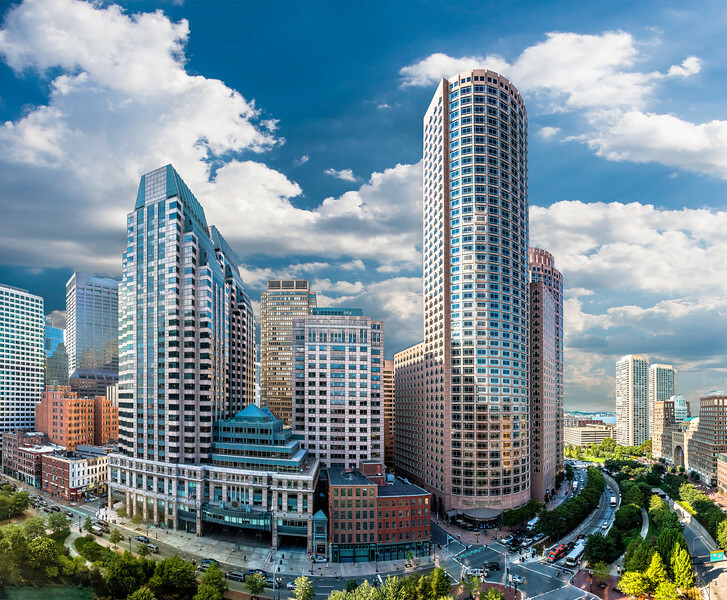 The image highlights One International Place, the 6th tallest building in Boston, and 125 High Street to the left. At street level is the Palm Restaurant, as well as the Boston Fire Department. Also visible, to the right, are the Boston Harbor Hotel, Harbor Towers, the Tobin (Mystic River) Bridge and the Rose Kennedy Greenway. Image Anatomy: Constructed of 12 individual overlapping images, taken with a Nikon D750 camera and Nikon 28-300mm lens at 28mm, f/11, 1/200 sec, ISO 250. Images were assembled into a single panorama using Adobe Lightroom and Photoshop. Printed from Lightroom using a Canon Pro-100 printer on Canon Pro Luster paper, with printer color management disabled.